Radio show: Tools for Writers. Podcasts, blogs and more! Join co-host Carol Topp as she shares with you her collection of tools for writers. Carol will discuss the podcasts she listens to, the blogs she follows and other tools to help writers manage their writing business. Yahoo Self Publishing group 3300 members. Sponsored by SPAN. Very active discussion. I get an daily email with the updates. There are usually 10-20 new posts every day. 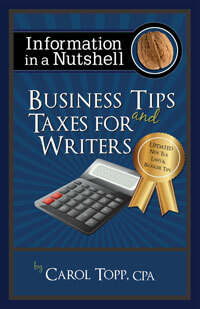 Carol Topp s a CPA and author of Business Tips and Taxes for Writers. She has self published 9 books in print and ebook formats and has also been published by a small press, Media Angels, whose owner Felice Gerwitz is the usual host of this podcast. Enjoyed this show…just found on my audio player.